I'm a wanna-be yogini. Here in Los Angeles where I live, many folks have adopted yoga clothes as their daily attire for running errands, walking the dog, shopping, meeting friends for coffee or lunch, and more. They tote their yoga mats and water bottles with them everywhere. I like the healthy look of these folks and I'm attracted to the idea of a yoga lifestyle. But beyond the fashion trend, what does it mean to live a yoga lifestyle? With this in mind, I've been eager to talk to Maren and Jamie Showkier about their new book, Yoga Wisdom at Work: Finding Sanity Off the Mat and On the Job (Berrett-Koehler). I'm curious about how yoga wisdom applies to the workplace ... and perhaps to the world, as well. I love the title of your book. What inspired you to write it? We have worked in or with corporate America for most of our careers (Jamie as a consultant and Maren as a journalist). When we met and began working together as consultants, Maren was just starting her yoga teacher training. As she went through the program, we had many lengthy conversations about the compatibility between the broad practice of yoga and the foundational principles and philosophies upon which our consulting business is based, which came mostly from Viktor Frankl, Paulo Freire and Martin Heidegger. Totally simpatico! Yoga is exploding in popularity across the U.S. Do you think this trend bodes well for sanity in the workplace, too? Certainly it has great potential, especially if people are willing to integrate these yoga principles into their daily work lives. The key is to recognize you can practice yoga off the mat. Imagine how much more satisfying and meaningful work would become if people lived out principles such as non-violence, honesty and non-greed at work; if they were dedicated to self-study and mindful of being connected to something larger than themselves. That is what meaningful work is about, right? Making a contribution to something larger than self? Workplace change is an inside-out process. What we see in organizations are people looking for ways to cope with some difficult and challenging situations at work, and to muster courage to make changes. Practicing yoga principles gives individuals a way to engage the people they work with in a different, more mindful manner. If a critical mass make changes like these, the organization will change. If not, the individual will still find more meaning and purpose at work. Many spiritual people struggle with living their spirituality in all aspects of life. They meditate, pray, do yoga, attend church, whatever -- but when they go out into their daily lives, they seem to forget. Got any suggestions for such folks? Great question. Most spiritual people would say they have a "spiritual practice," and implicit in the action of any practice is the struggle to live out their intentions. One of the most powerful practices for us has been spending time getting clear about our intentions through continually reflecting on questions such as, "Who do I want to be in the world? What can I contribute? What legacy do I want to leave?" Once you have clarity about these things, that becomes your guide to action. Self-awareness and presence are key. Am I taking the right action at this time based on who I want to be? So the practice is about developing that kind of consciousness and finding ways to keep you connected to your intentions. These can be things such as meditating, or journaling or frequent conversations with others. Actually, it could be something even simpler than that. One of our friends put a bumper sticker on her car that says "Practice Kindness" as a way of helping her remember to live out that intention. She said when she is tempted to curse or flip off aggressive or rude drivers, remembering that bumper sticker helps her stick to her intention of being compassionate. Do you see a link between yoga and creativity? Yoga and productivity? 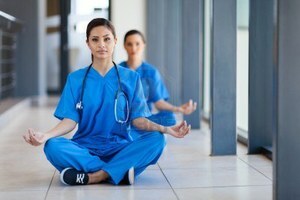 Yoga and morale? Yoga and corporate culture? Well, yes! We could easily connect yoga with all of those things. And there is even research to back some of it up. For instance, the practice of non-attachment is linked to creativity, because you don't get bogged down in thinking there is a "right" answer or one way to accomplish a task. Another example -- productivity is often tied to the idea of "multitasking," which research has shown is impossible and is actually counterproductive. Mindfulness and focus, both important yoga practices, are the antithesis of multi-tasking and produce higher quality results. The first (yamas) and second (niyamas) limbs are about morality/ethics and personal conduct, and each of them have implications for how you work, being honest, using only what you need, having discipline. Another precept is santosha, or contentment, and this is a practice of recognizing the choices you have in the face of disappointment, and fostering contentment instead of cynicism or resentment. Learning breathing techniques can help people think before they speak, or create energy, or calm down in a high-heat situation. We've found morale to be a tricky topic in today's workplace. For decades, leaders and managers have been told it's their responsibility to build morale. Organizations have spent millions of dollars disseminating that message, but it doesn't work. Morale is each individual's responsibility, and yoga helps build morale by creating the realization that people are fully responsibility for their life and work. In yoga, we use the term "namaste" which means "the divine light in me recognizes and honors the divine light in you." Everyone has this light. It's up to each of us to uncover it ... and to look for it in others. All of these practices would have a huge positive impact on morale and corporate culture. Any idea how many organizations offer yoga classes in the workplace? We would love to know the actual number, but we do know it's growing. Some just offer or subsidize the physical practice as part of employee wellness programs. 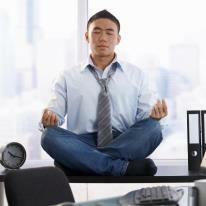 Others are starting to create conditions for people doing yoga and meditating at work. Some of the companies that support these practices are Apple, Google, General Mills, Prentice Hall Publishing, Whole Foods and Aetna. Steve Piersanti, the CEO of Berrett-Koehler (our publisher), starts all his meetings with a moment of reflective silence to encourage mindfulness. That is a yoga practice even though he probably wouldn't call it that. I'm sure there are more, and we are so encouraged to see that leaders are recognizing yoga's benefits to employees, and ultimately to their organizations. How do you see yoga affecting American culture and society? It has great potential, but it ultimately comes down to whether people choose to practice and how committed they are to honoring the precepts. The practice is invaluable, especially when we stay present to the fact we are all human. We need to be willing to forgive each other for that. And if people could learn to be truly present, especially in the face of our crazy, fast-paced, noisy technology-obsessed world, what a gift to society that would be! And how much more humane and productive our organizations would be! Is yoga just a white, upper middle class thing? Talk to me about yoga and diversity in America. We can see why people would see it that way. Something about Maslow's Hierarchy of Needs probably applies here -- because upper-middle class people aren't struggling to feed, clothe and shelter themselves, which gives them more time and resources to investigate practices such as this. But there is no reason it should be that way, and we see signs of outreach to all kinds of communities, people of all races and ages. We are seeing yoga for special populations, such as the elderly or those in the military or people with disabilities. Another example: our book launch partner, Namaste Charter School in Chicago, serves kids who come from often difficult, inner-city backgrounds. There are public school systems and colleges across America adding yoga to their physical education programs. Several universities also have yoga as part of a larger curriculum in spirituality. And we know a couple of major yoga organizations have established programs to expose a more diverse population to the benefits of yoga. Any question I should have asked you but didn't? In Sanskrit, "yoga" means "union," and the practices are aimed at creating a union with the divine as defined by the individual. This could be a spiritual deity or simply one's higher self. The thing we'd like to stress is that yoga is much more than the latest physical fitness craze. Yoga is a multi-faceted practice that helps us know ourselves and see the potential in ourselves and others. It gives us a guide for developing potential, which is hugely relevant for the work people do. Many of the practices can be done anywhere, anytime. Lots of people are practicing yoga without even realizing, so developing a conscious yoga practice would be even better -- for the individual, for the workplace, and for the world.